Fountain health and beauty supplements are proven to have a positive impact on your beauty and well-being. They are water-soluble, easy to take and tailored to your beauty needs. 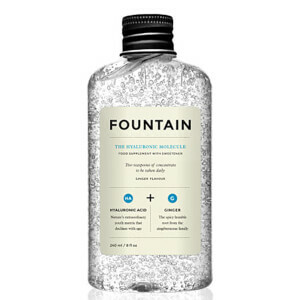 Choose from the Fountain Hyaluronic, Geek, Super Green, Phyto Collagen, Energy, Happy, Hair or all-round Beauty Molecule to target and improve your specific health and beauty challenges. Fountain is changing the world of beauty, so don't watch from afar, get involved. Boost your energy levels with Fountain The Energy Molecule. This drinkable ginger flavoured supplement is designed to improve cognitive functions and support the central nervous system. Containing Vitamin B12 and ginseng, it will enhance your energy levels so you can get away with those late nights! 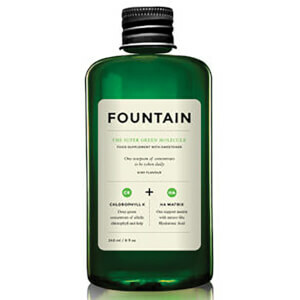 Made with vegan-friendly hyaluronic acid, Fountain The Hair Molecule contributes to rapid growth of your hair and nails. This berry-flavoured drinkable supplement is free from artificial colours and flavours and a 2 tsp serving provides 1000mgs of silicone and 200mgs of biotin, making it beneficial to those suffering with a dry scalp. 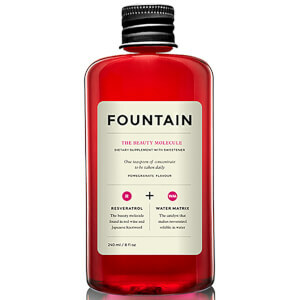 Fountain The Beauty Molecule is a pomegranate flavour supplement containing resveratrol, made to promote health, youth and longevity on both the inside and out. One 5ml serving provides 40mg resveratrol, found in the skin of red grapes, to promote normal cell division and offer highly effective anti-oxidant and anti-inflammatory properties. Winner at the Cosmopolitan Beauty Awards 2014, Fountain The Glow Molecule targets dullness and age spots on the skin. The glutathione complex rebalances damage caused by the environment as well as free radicals in the skin for an even toned, brighter complexion!